Nepalese kings organised massive hunts to get on the good side of the British – hunts that may have been terrible for conservation, but worked diplomatic magic. In 1876, a year before Jung Bahadur, the first Rana prime minister of Nepal, would pass away, Prince Albert Edward, the heir to the British throne, was on a state visit to India. Jung Bahadur had, during the 1857 uprising, personally led Nepali soldiers into relieving the besieged East India Company men at Lucknow and seven years earlier, become the first Nepali noblemen to cross the seven seas and visited Great Britain and France. Till the advent of the Ranas, the Gorkhas had maintained a careful distance from the British in the subcontinent; after all, the 1814-1816 war had seen them lose a big chunk of territory to the British. But Jung Bahadur was different. He had seen for himself the industrial strength of Europe, and after China’s almost non-response during the Nepal-Tibet War of 1855-56, was convinced that the British were the emergent power in the subcontinent. Nepal’s equidistant foreign policy was replaced by a whole-hearted support for the British empire, in hopes that a friendly alliance was more suitable to maintaining Nepali sovereignty than a belligerent approach. It was against this background that some of the most massive shikar campaigns the subcontinent has ever seen were held in the Nepali Terai, with no one but the Ranas who put up a “bigger ‘big shoot’ or offered a more spectacular hunting ‘bag'”. These shikars were not just a display of ‘manhood’ or ‘heroic’ skills with the gun, but also diplomatically useful. As anthropologist Mark Liechty writes, “with game stocks dwindling elsewhere, Nepal’s Terai lowlands acquired almost mythical status among British hunting elites”. From Prince Albert’s visit onwards, these shikars allowed the Ranas to confabulate with the British colonial elite without needing them to ‘ritually contaminate’ the capital, Kathmandu. Jung Bahadur himself was a hunter of mythical status; apocryphal stories maintain that he shot and killed over 500 tigers himself. In White Tiger, Diamond Shumsher’s epic Nepali novel about the end of the Jung Bahadur clan and the rise of the Shumsher clan, a white tiger the maharaja sees during his last hunt symbolises his own death. 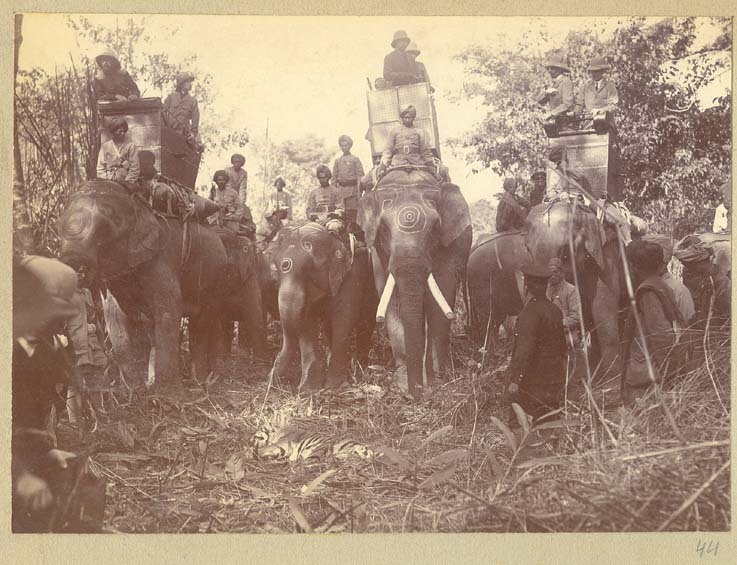 During Prince Albert’s shikar expedition, an 1877 book recollects, “Seven hundred elephants were employed in beating the jungle, and the Prince shot no fewer than six tigers [in one day].” The hunt had been organised in what was then called ‘Naya Muluk’, a strip of Terai flatlands the British had returned to Nepal in gratitude in 1860 and today encompassing the districts of Kailali, Banke, Bardiya and Kanchanpur. The 700 elephants crossed the Sharda (or Mahakali) river in single file in the grasslands of what is today the Shuklaphanta National Park, and the prince went out with a pack of tame elephants to try to capture a wild one. Soon after, other members of the royal family such the duke of Portland (in 1884) and Prince Albert Victor, the prince of Wales’ oldest son (in 1889-90), came to Nepal for organised shikars. In March 1893 came another royal visitor, a Prince Franz Ferdinand, perhaps the first non-British royalty to participate in a Nepalese hunting expedition. The ‘situation in Tibet’ was the inability of Peking to convince the Dalai Lama to follow the 1890 Sino-British Treaty and Curzon’s conviction that he needed to deal with Lhasa directly, even at the cost of antagonising China. Further, the involvement of Nepali troops in quelling the Boxer rebellion hadn’t pleased Bir, who thought it was an unnecessary provocation to China. It was also in 1901 that Russia had begun to show greater interest in Tibet, kicking alive the ‘Great Game’. Three years later, when Francis Younghusband undertook his Lhasa military expedition that killed nearly 2,000 Tibetans, including unarmed ones, Chandra Shumsher’s offer of Nepali troops was declined, “but Calcutta did accept the loan of several thousand yaks and porters for transportation purposes”, a move the Tibetans weren’t very happy about. For his support to the Empire, Chandra was made Knight Grand Commander in January 1905. Chandra’s affinity with the British continued well beyond Tibet, when he offered the British ‘ten battalions’ of the Nepal army to fight in the First World War, and ‘facilitated recruitment’ of nearly 60,000 Nepalis into the various Gurkha battalions of the British. “About twice that number were taken into supporting non-combative roles in units like the Army Bearer Corps and Labour Battalions,” wrote historian Pratyoush Onta. But before this generous offer for the ‘Great War’, in which over 20,000 Gurkha soldiers were killed, came the infamous 1911 King George V hunting expedition. The 1911 Chitwan hunting expedition, which was hosted by Chandra, took place between 18-28 December, during which 18 rhinos, 39 tigers and four sloth bears were killed. Hosted as part of the grand coronation celebrations, King George was met with a Nepali royal party that consisted of Chandra, his two sons and ‘His Excellency’s’ followers, who numbered at 12,000, besides 600 elephants with 2,000 attendants’. In 1938, just before the Second World War, a three-week hunt with Lord Linlithgow, viceroy of India, saw a total of 120 tigers, 27 leopards, 15 bears, and 38 rhinos being slaughtered. With Rana prime minister Juddha at the helm, “over 200,000 Nepalis served in British units during the war“. Photographic records of these hunts are perhaps the best evidence that megafauna population across the subcontinent was driven to extinction levels because of such massive hunts. But conservation was the last thing on the minds of anyone participating in these hunts. ‘Hunting diplomacy’ lent the Ranas much-needed social capital with the British elite, and an invite from the Ranas of Nepal became a much-coveted affair for the colonists themselves. It would eventually lead to the establishment of various ‘hunting companies’ in Nepal, led by American John Coapman, African big-game hunter Charles Cottar and the Irish hunter Peter Byrne, who received a hunting concession via Prince Basundhara, brother of King Mahendra, after the fall of the Ranas. It was not until 1972 that hunting was outlawed in Nepal except in one reserve in the Himalayas – but the damage to megafauna numbers had already been done. Amish Raj Mulmi is a Nepali writer and a publishing professional.